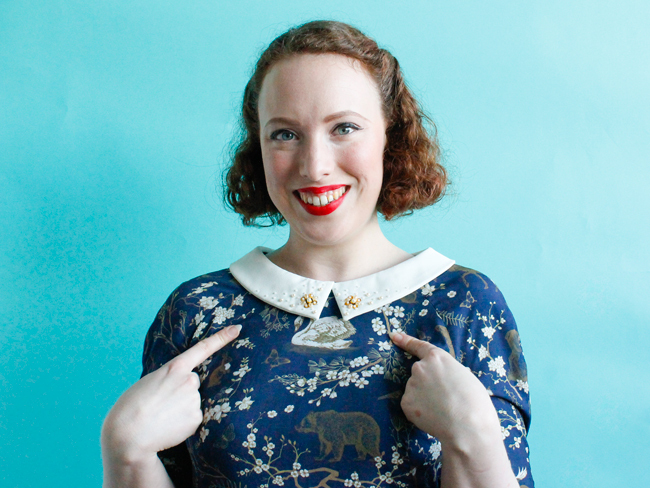 Tilly and the Buttons: Team Buttons Christmas Party Outfits - and a Discount Code! Team Buttons Christmas Party Outfits - and a Discount Code! With Christmas just around the corner, Joanne and Katie of Team Buttons have been stitching up their festive party outfits ready to strut them on the dancefloor! We partnered with Spoonflower for their Holiday Blog Hop for this post and they kindly sent us the beautiful fabric we used. 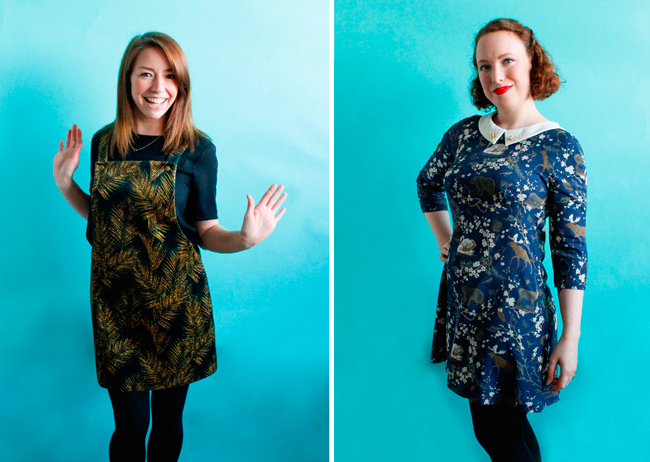 Let’s hear from Joanne and Katie about their gorgeous new Christmas dresses! Joanne here! 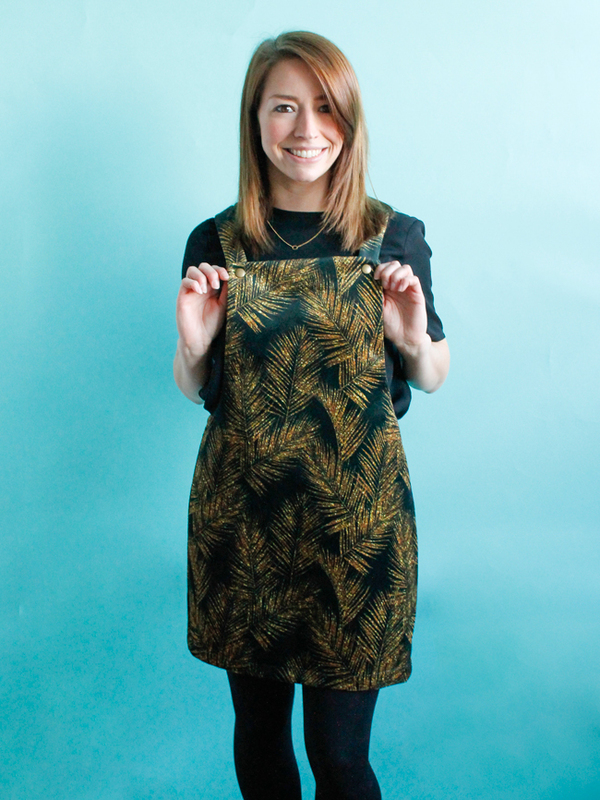 My go to for a festive party dress is something that sparkles, so this was where I started my search on Spoonflower. 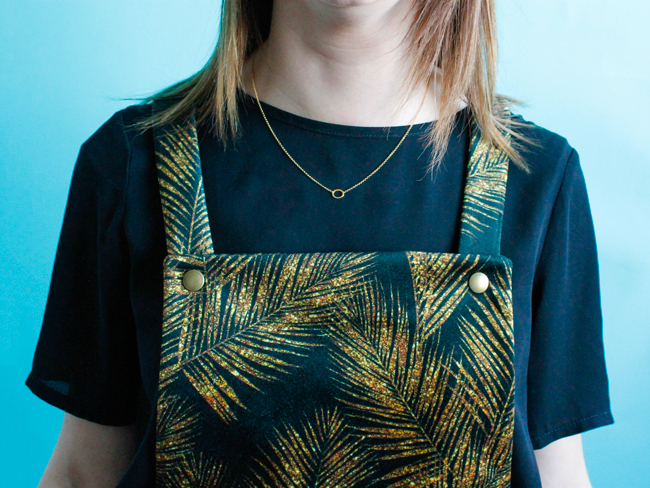 I picked the Gold Glitter Palm Leaf print in the Celosia Velvet. The design doesn’t state that actual glitter will be printed, but the imitation of the golden leaves gives a stunning appearance of a twinkling glow. Super happy with my choice, the velvet has a good weight and is super soft – ideal for whipping up an elegant Cleo dungaree dress. I decided to cut my Cleo on the fold so I didn’t have to pattern match. 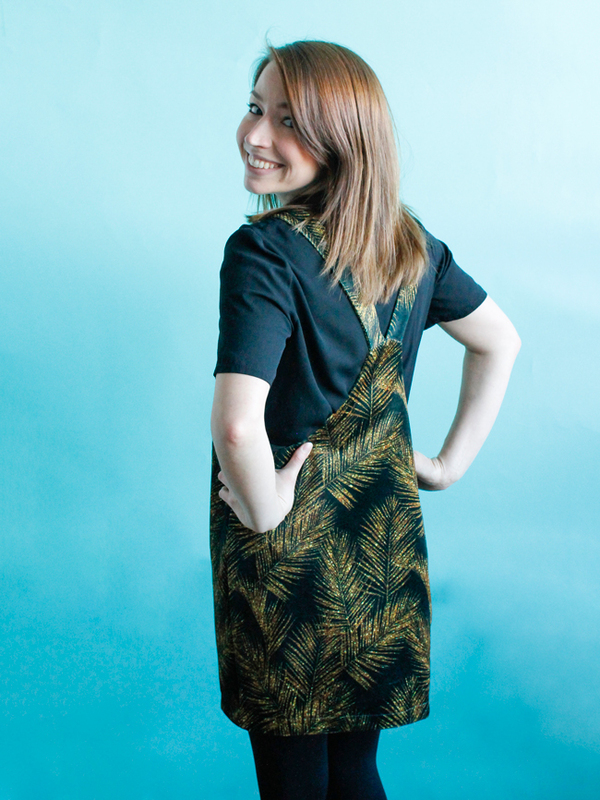 My aim was for a sleek take on the dungaree dress so I didn’t topstitch over the beautiful design either. This meant that the Cleo came together super easily with the addition of brass poppers, and took me about 5-6 hours in total - and I’m not a speedy sewist. Cleo is the perfect style to dress up or down and I can’t wait to wear it to the Tilly and the Buttons Christmas lunch. The relaxed fit means I can definitely fit in a dessert, or two! Hi guys, Katie here! Choosing the fabric for this project felt a bit like a form of beautiful torture! There were so many scrumptious patterns to choose from, I genuinely could have searched for weeks and not got bored. I am very drawn to toile de jouy style prints so when I came across the Spring Toile (Navy + Gold) fabric I quickly feel in love and knew it had to be a Françoise! Even though it's technically a spring fabric I thought the colours were really festive and I knew it would look gorgeous with a sparkly beaded collar in a contrast colour. I chose the Crepe de Chine fabric from Spoonflower, which was beautiful but a little lightweight for Françoise so I also lined the dress fully to add a bit more structure to the finished outfit. 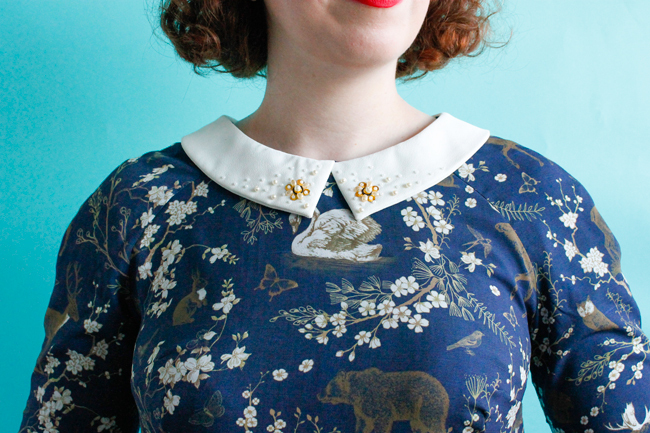 With the extra details of adding a lining and a hand beaded collar this was a bit of an involved project - it took about a week of evening sewing sessions to get it finished - but I'm so happy with the finished result it was completely worth it! This dress makes me want to dance the night away and I already have more versions planned, I love it so much! 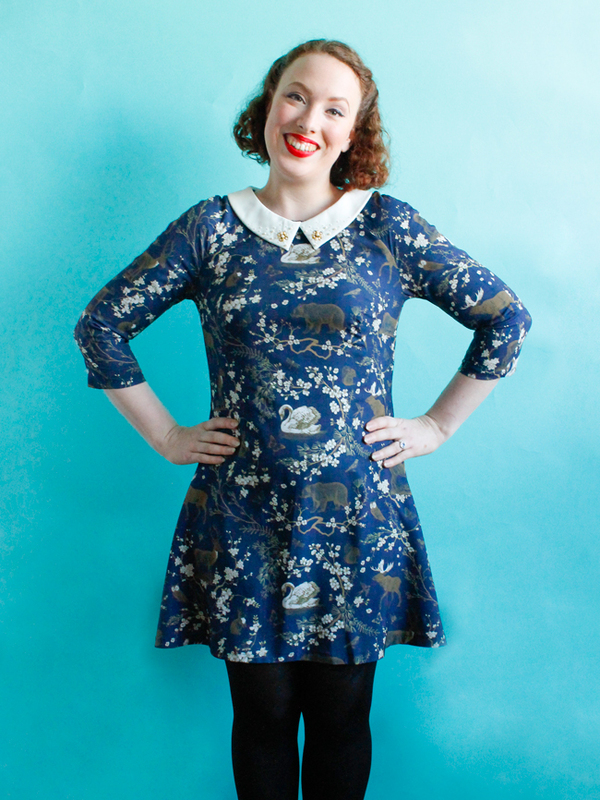 Spoonflower have kindly sent a 10% discount code for you to use on their site - hooray! Enter code: Tilly17 at the checkout until 31 December. Want to create your own similar outfit? 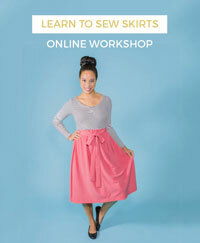 Get 10% off the Françoise and Cleo patterns in our shop! Use code: SPOONFLOWER at checkout until 31 December. Are planning to make your own festive party outfit this year? We’d love to see! 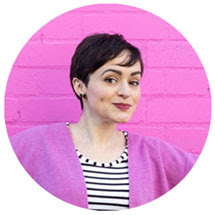 This post was sponsored - thanks to Spoonflower for supplying us your gorgeous fabric.